The Long Board | Santa Monica Pizza & Pasta Co. 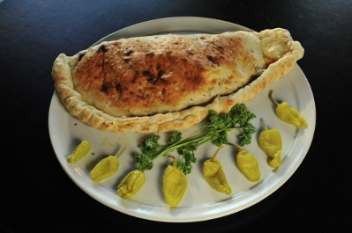 This is our legendary Long Board Calzone. It has everything you could ever want in a pizza, including meatballs, sausage, pepperoni, mushrooms, black olives, bell peppers, red onions, and ham. The best part about it? It weighs a whopping FIVE POUNDS! And it’s over 16 inches long. Any challenge this large deserves its own reward, and we are willing to give it to you. If you can finish it in 30 minutes, you get to rename it! This challenge is so legendary, it is rumored that only 3 people in the Fanzinni family have finished it. Antonio Fanzinni in 1964 and Frankie and Luciano in 1971. Are you up to the challenge? Stop by and give it your best shot! Categories: Uncategorized | Tags: calzone, extreme eating, italian, pizza | Permalink. Author: Santa Monica Pizza & Pasta Co.
Santa Monica Pizza and Pasta Co.
We specialize in rustic-style pizzas, calzones and "pastazones," which are calzones stuffed with pasta. We also serve "pizzinis" -- house-made flatbread sandwiches that are "stacked and packed" with fillings like meatballs and barbecued chicken. Our pasta specialties include chicken Alfredo, pasta pomodora, mac & cheese, ravioli and lasagna. Finish it all off with cheesecake, brownies or tiramisu for dessert. Come in and try us out. You wont be disappointed.